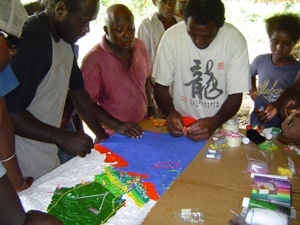 The 1:20,000 scale (2 x vertical exaggeration) Participatory 3D Model (P3DM) of Chivoko village in the Tavula ward, Choiseul Province, Solomon Islands was completed in June, 2009. 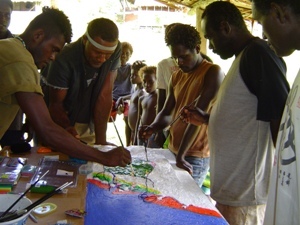 The model measuring 1.2 m x 0.4 m (192 km2 on the ground) has been the 1st Participatory 3D Model constructed in the Solomon Islands. The model was done to serve a key negotiation tool for the Chivoko community to map out the watershed and coastal areas it depends on to address the challenges facing sustainable resource management and conservation. 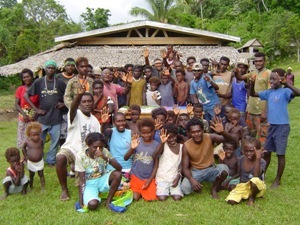 A total of 60 representatives from the Chivoko community including youth, elders, women and men, students and chiefs; representatives from “Sasamunga Live and Learn”, The Nature Conservancy (TNC), the “Lauru Land Conference of Tribal Communities” (LLCTC), and the Choiseul Provincial Fisheries attended the exercise. The initiative aimed at securing the conservation of the Chivoko Watershed forests (approx 8000 ha) and place these legally beyond the reach of industrial logging ventures. The project has drawn on national expertise to produce a collaborative watershed management plan which served as guidance for sustainable forest development practices by a community cooperative. The exercise has been made possible by the coordinated effort of The Nature Conservancy (TNC), the Lauru Land Conference of Tribal Communities (LLCTC) and funding provided by the by Swiss Reinsurance Company, Switzerland. P.S. This exercise is a follow-up to the regional P3DM training organised by CTA and WWF In Fiji in 2005. A number of delegates from NGOs and CBOs were trained in organising and conducting P3DM exercises. Catherine Siota attended the training and put acquired skills into practice in replicating the process in Solomon Islands. The P3DM exercise was a success! The resources and watersheds were mapped and the project moved on to the next stage of implementing the sustainable milling of timbers from the forest with a sustainable management plan of use. This P3DM has been replicated in Sasamunga in Choiseul. According to Catherine the SILMMA network members have shown interest in this mapping tool if they could be trained as well. This tool has indeed boost community confidence in interacting with foreign visitors. Siota C. and Kereseka J. 2009. Villagers learn to use new mapping system. Solomon Star News; 9 July 2009. Dao Nguyen and Kereseka J. 2008. 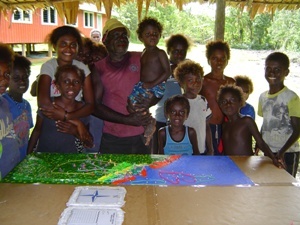 Tarevalata ‘Kastom’ Conserved Area Chivoko, Lauru Island, Solomon Islands, Results of a grassroots discussion. Report published by the Centre for Sustainable Development (CENESTA) with the support of the WCPA-CEESP Strategic Direction on Governance, Equity, and Livelihoods (TILCEPA) and the Theme on Governance, Equity, and Rights (TGER) thematic networks of the World Conservation Union (IUCN). Participatory video made by Chivoko Village. The Chivoko video was produced by the residents of Chivoko Village following a two-week workshop on the impacts of climate change. As the video demonstrates, insights into climate change also translated into a wider understanding of resource management leading Chivoko villagers to reassess where they build, how they fish their reefs and how they log their forests. Follow the Chivoko villagers as they tell their story. Modelling the Future in Boe Boe Community. Seventy-four-year old Jean Taqevala silenced the meeting as she journeyed from the old village in the hills, over Snake Ridge and down the forest path to the narrow coastal plain where the Boe Boe village now stands. She had not physically made the journey for more than four decades, but her memory was reconnected through a large 3-dimensional model of customary lands that villagers had crafted over a week-long participatory mapping exercise. See how they turned a conventional flat map into a physical, hands-on relief model that everyone could see, feel, touch and connect with.